This holiday season, the Heineman Service Club joined the Heineman staff in collecting toys and donations for the Marine Corps “Toys for Tots” program. 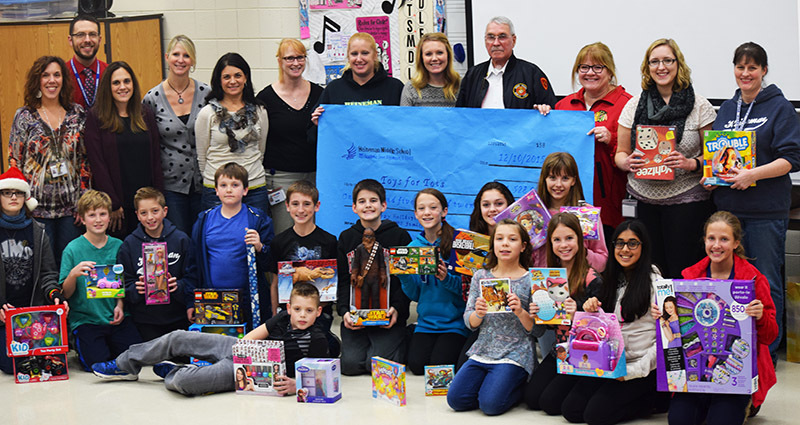 Heineman students and staff collected approximately 50 toys and raised $1,528 for children in McHenry County. Buck Vander Leest stopped by on Thursday, December 10, to collect the toys and explain the impact of the program to the Service Club. 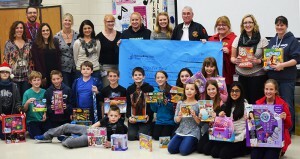 The students learned that the McHenry County “Toys for Tots” program supports approximately 12,000 children in need throughout the county. The students then assisted with loading toys from Heineman, Conley Elementary and Mackeben Elementary into the “Toys for Tots” van. In addition, 67 staff members participated in “dress down for dollars” weeks, with 62 of those staff members donating at least $15 to qualify for a $5 bonus contribution from Heineman administration. Overall, the Heineman “Toys for Tots” drive was a huge success this year thanks to the generous students, families, and staff of Heineman Middle School.